The issue and solution described here is by design, but not known by every customer so here’s my short write-up on this subject. 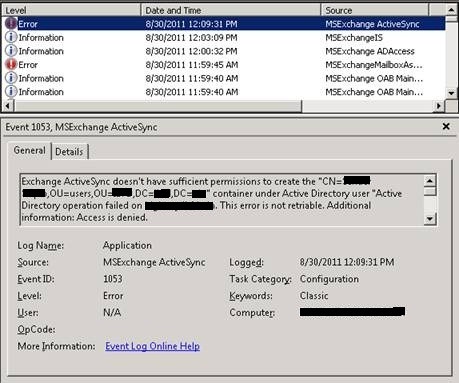 The remainder of the message reads: “Make sure the user has inherited permission granted to domain\Exchange Servers to allow List, Create child, Delete child of object type “msExchangeActiveSyncDevices” and doesn’t have any deny permissions blocking such operations”. What happens when setting up ActiveSync is that Exchange tries to create a container named ExchangeActiveSyncDevices below the user object in Active Directory and will store in that container an MsExchActiveSync object for each ActiveSync device. Apparently Exchange doesn’t have sufficient permissions to create these objects. To fix this, open up Active Directory Users and Computers. Now, to be able to inspect the security settings, we first need to activate Advanced Features if not already set. To do this, from the View menu option, select Advanced Features. Next, navigate to the user object experiencing the issue. Open up Properties, select the Security tab and click Advanced. 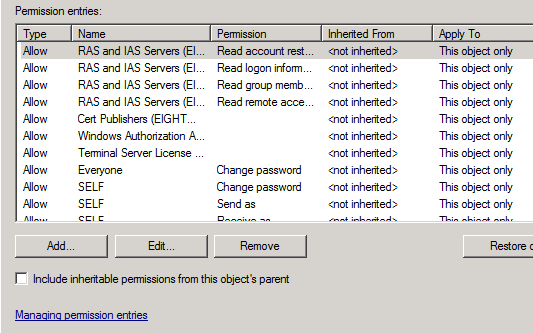 Notice the Include inheritable permissions from this object’s parent is not set, the reason for Exchange not having any permissions on the object. Note that Include inheritable permissions from this object’s parent by default is not enabled for members of the protected groups, e.g. Domain Admins. In fact, every hour the DACL on members of protected groups will be reset and inheritable permissions will be removed. This process is called AdminSDHolder which is to prevent inappropriate changes from being made to protected groups, accidently or otherwise. Michael B. Smith did a nice write-up on this subject here. This is also the reason why bypassing the AdminSDHolder limitation by manually granting Exchange permissions would be inappropriate. To prevent this issue, it is recommend to follow an old, yet far from rusty administrator best practice, which is to use one account for day-to-day operations, e.g. work and e-mail, and another account for administrative purposes.